All iCard Services products can be found on their own individual product pages or purchase them below, more options can be found on individual product pages. Can't find the part you are looking for? Contact us today! 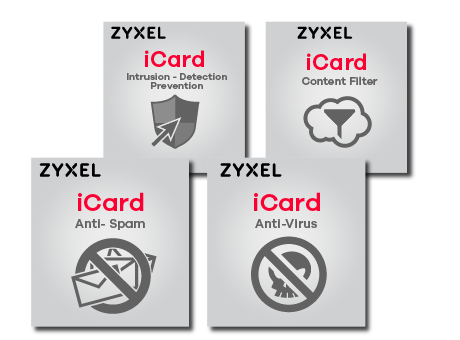 iCard is used to activate the external services bundled with the ZyWALL Series. There are three external services that require activation via myZyxel.com with the iCard Service License Key. There is also a label on the back of each iCard package indicating the ZyWALL model it supports. Note: External services can't be activated if the iCard and the ZyWALL model don't match correctly. For device firmware 3.64 and before: Please refer to the document link. Log into Web GUI, the default setting is http://192.168.1.1. Switch to the registration page and apply for a myZyxel.com account if this is a new device or you wish to register the device with your existing account. Trial services are available after registering the device. User can find their iCard service license key in the iCard package. The license key format may vary for different services. User can activate standard services by entering the iCard service license key found in the service page. The device will automatically judge the type of service being activated by the iCard service license key.